Specially Design for 12S Li-Po! Ideal Upgrade for Align T-Rex 550/600 and other 550/600-class EP helis! Higher Efficiency, Less Heat, More Power! The Scorpion HK-4025 motors have been developed for the 550 to 600 class electric helicopters and the HK-4025-550KV motor is suitable for the glow to electric conversation of 50 size helicopter. 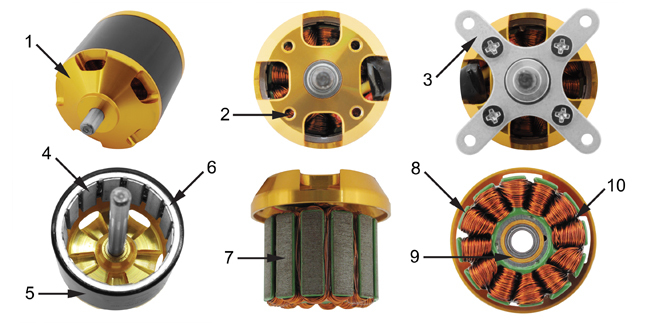 These motors are designed to provide all the power that you can use, while still maintaining excellent efficiency and cool running characteristics. This Scorpion HK-4025-630KV motors come with 4mm male Bullet style connectors already attached, and include a hardware package that contains 3 matching female Bullet connectors for your speed controller with matching heat shrink tubing. For maximum strength, this Scorpion HK-4025-630KV motors feature an 8mm motor shaft that is ground down to a 6mm diameter at the output end to fit standard size pinion gears. Since the HK series motors are primarily designed for Helicopter and Ducted Fan use, they do not include a prop adapter. If you intend on running a prop on this motor, you will need to purchase a prop adapter for a 5mm shaft. Specially designed NdFeB magnets with a 200 C (392 F) temperature rating for trouble-free operation.